This post for 2018 Gift Ideas: Gifts Under $50 contains affiliate links. Please read this blog’s disclosure post for more info. I can’t promise an entire Gift Guide series this year — with my parents’ house under contract there’s a lot of last-minute trips up to Connecticut! But I would like to share some gift ideas that I’m gifting this year or that have worked well in the past. With that in mind, let’s take a look at my first 2018 Gift Ideas: Gifts Under $50. You can easily shop everything mentioned in this post with photos here. We all have that one friend, right? The one who’s wearing a cashmere cardigan in the middle of July because there’s the slightest breeze, or the one who insists the office thermostat stay at 78 degrees year-round. In honor of that friend come these ideas. It’s kind of a gag gift but this year I got three girlfriends this USB Power Heating Mouse Pad ($20). It’s basically a mouse pad with a hand warmer! I’m already giggling at the thought of them using this — I have a feeling they will use theirs and love them! I chose to link to one shaped like a kitty, but these little hand warmers are available in a bunch of shapes. Of course you could always just get your giftee gloves. In that case, I highly recommend these Touch Screen Gloves ($9). I buy 2 pairs each Winter; one in black and one in a color. They last the whole Winter and make texting on cold days a breeze. The classic pattern goes with any outfit and unlike many more expensive tech gloves I’ve bought these do not unravel after a few weeks. They last about 1.5 Winters. If you’ve not into the snowflake pattern here’s another set of tech gloves that I also own and like. I’m a huge fan of this Slouchy Beanie Winter Hat ($14). It’s lined with fleece and has a very city chic style, though it’s also great for Winter outdoor runs or other exercise. Last year I inspired my entire running training class to buy it! Although all the photos show a woman modeling the hat it also looks great on men. Several colors come with an optional neck warmer, and the hat is also available in a kids’ version. I’m very impressed by this hat’s ability to take a beating and still look great. It’s amazing quality for the price! The same brand makes this Winter Visor Hat, which I gave to a friend last year to her delight. Do you like a really big pom pom on your Winter hat? I do, which is why I love the Winter Knit Big Pom Hat ($18). The black version with a tan pom pom appears in the collage topping this post. Not only is the pom pom huge, it’s a really cute hat on! It gets the thumbs up from Alex and it’s not unusual for people to stop me at the Farmer’s Market to ask where I got the hat. It comes in a slouchier version too, which I also own and love, though the pom pom isn’t as big. Sometimes one pom just isn’t enough. When that’s the case, I recommend gifting the 2 Pom Ears Cable Knit Hat ($20). It’s ‘pricey’ by Amazon standards but well worth it. It comes in five colors and unlike some of the other double pom pom hats I found searching Amazon, this one is really good quality! I own the brown (on me here) and the pink. As you can tell, hats are one of the first things that come to my mind when I’m thinking of 2018 Gift Ideas: Gifts Under $50. It can be hard to shop for friends with distinct styles or friends with very trendy sartorial leanings. I don’t think you can go wrong with a nice Blanket Scarf ($14, pink plaid shown in collage). Want to take things to the next level? Pick a color from the scarf and buy them a matching Greek Fisherman’s Cap ($15). Another very easy 2018 Gift Ideas: Gifts Under $50 is sunglasses! Normally for a stylista you’d be talking hundreds of dollars for a pair that might pass muster. However one of this year’s trendiest brands is Privé Revaux, and their whole value proposition is designer sunglasses for $30. Another present sure to please any trendsetter is this G-Style Gold Buckle Belt ($33) shown in the photo collage. Yes, it’s basically a knockoff of the omnipresent Gucci belt many influencers are wearing ad nauseum. It’s not really my taste but many of my girlfriends swear this is the best belt ever! I feel like this “inspired by” take on the Gucci belt is perfect for a teenager or someone who likes the idea but realizes it doesn’t have longevity. There’s a version with a smaller buckle and also a logo-less double loop belt that’s more my style. You may want a more practical yet stylish gift idea and in that case I’d like to draw your attention to the Pedag Lady Gel-Velvety Insole ($13). For anyone that wears heels all day these are a Godsend!! I read somewhere that these are the insoles Princess Kate wears and lord knows she’s on her feet all day at some of the events she attends! She seems to do quite well and so do I with these insoles. They won’t make a totally painful pair of shoes wearable. But they do help quite a bit with that low-grade throbbing I can start to feel in my feet when wearing heels, especially when standing still for long periods. If you fear your stylish friend has no more room in her closet for clothing you could get her a stylish piece for her home instead! I recently bought the Vintage Glass Tray ($39) for a friend who wants a nice way to display her beauty items, and I liked it so much that I just bought it again for myself! I guess that’s the thing about 2018 Gift Ideas: Gifts Under $50; you may like the things you buy so much you want to own them too! This tray is a beautiful modern update on a vintage classic, with airy metal detailing. The tray is bigger than it looks though — there’s also this set of two available from a different seller if you’re not sure what size to gift. With no kids of our own to worry about shopping for, Alex and I are free to be that cool couple that buy the best Hanukkah and Christmas presents for kids. Ok, actually we might more likely be the clueless couple that hopes our present is good — we ask parents for help!! Want a 2018 Gift Ideas: Gifts Under $50 idea that pays of the lesson of patience? Look no further than the Teabloom Flowering Tea 12 pack ($20). These teas arrive as little green balls. Put them in hot water and they slowly open up into beautiful flowers! We have several friends whose daughters LOVE these teas! They take about 5 minutes to open which is a good threshold for kids in the 2-10 range. The key is to use a clear teapot; I usually gift this one with the teas, shown just below the teas in the photo collage topping this post. If you’re worried about an all-glass pot, this pot has a glass front only. Tech lovers are just grown up kids, right? Aren’t we all really? When it comes to 2018 Gift Ideas: Gifts Under $50 good tech options can be hard to find. Luckily technology is getting ever-better and as it becomes more efficient, prices drop. So there are lots of great ideas to choose from this year! Firstly, do the phone addict in your life a favor and get them the Portable Charger 10000mAh ($26), so they’re never out and about without a way to charge their phone. I recently had to loan a senior exec my iPhone case on a client visit when his phone’s life got sucked out of it by a battery-hungry presentation. The charger I linked is sleek enough to fit into a ladies’ purse, but holds quite a power punch. There’s a larger version too (both in capacity and form factor) that still makes it under $50. If you want to gift a battery they’ll never forget last year I got Alex this battery case before eventually getting it for myself too. However, that case is over the $50 threshold for this post. Another tech gift my office is buzzing about this year is the Elecstars Touch Bedside Lamp ($26). This is basically a really fancy Bluetooth speaker for your music, but with a cool ambient light people use to help them fall asleep. The light can glow in many different shades. I like that this version has no alarm clock on it (I find clocks stress-inducing on the nights I can’t sleep) but there are versions with clocks on them if that’s a must-have for you. Amazon shows it with it screws, nails and such, but the Magnetic Wristband ($17) has many more uses. I gifted this to a friend who was always losing sewing needless while working. Another friend uses this for her pincushion, needles and pins while working on clothing. It may not be the most beautiful piece ever but it’s highly functional! If you like a lower energy bill or know someone else who does too, the WiFi Smart Plug ($20/2) is a fantastic gift! Basically the idea is that these plugs are wifi enabled which allows you to control the amount of juice sucked by whatever is plugged into them. For example, many of my friends use these to remotely turn off of the plugs once their iPads or laptops are done charging for the day. This time of year they’d be great for a Christmas tree or an electric menorah! The plugs are even Alexa-compatible. Is it just me or does the line between foodie and techie seem to be blurring? Personally I love kitchen tech tools that help me make cooking easier. For example, while it’s really fun to pop the cork on wine bottles ourselves, sometimes party hosting dictates that we do it the easy way. Enter the Cordless Electric Wine Bottle Opener ($18). This opener even comes with a handy little tool that unwraps foil around wine bottle corks! When I attend catered parties I nearly always see these around — in fact that’s how I first found out about it. It’s a total lifesaver! Another highly functional item we’ve gifted (and received!) is the Crab Multi Tool ($15). I was unimpressed with it at first but we decided to keep it on our kitchen counter. Now? I can’t imagine life without it! I find myself reaching for the crab at least once a day! And though it’s a little less versatile, the Pulled Pork Shredder Claws ($13) are another very handy kitchen tool to have on-hand at all times. They make an excellent gift! Need a conversation starting gift sure to satisfy a food lover? Look no further than the Fish Magic Soap ($15). Somehow (aka science) allows this stainless steel soap in the shape of a fish to remove the smell of all things oniony, garlicky, and well, fishy from your hands while cooking! Ask some fellow party attendees to try it. No one can resist!! Finally in this section you may or may not know that I’m obsessed with cheese boards! By far my favorite one to gift is the Bamboo Cheese Board with Cutlery Knife Set ($35). Having the utensils right inside of the board is genius for picnics or other events that require travel before eating. The little trough around the edge of the board holds crackers perfectly. If your friends tend to have large parties, I recommend this larger version which just eeks in under the price limit for this 2018 Gift Ideas: Gifts Under $50 guide. But this board does more than cheese! Recently Alex and I had dinner at two friends’ apartment. I’d gifted them the cheese board two years ago but they taught me something new about it when we ate not cheese off of it, but sushi! The board worked exceptionally well for presenting the sushi rolls and splitting the rolls up between us. From charcuterie to fruit platters to cookies, this board makes pretty food presentation a snap. If you want to buy a present for someone who loves capturing pictures and videos on their adventures, but doesn’t want to make a pricey GoPro purchase, I can’t say enough great things about the FITFORT Action Camera 4K ($47)! It looks and operates just like a GoPro and came with more accessories than our GoPro did! It has mounts for helmets, a necklace/lariat mount, a hand mount and pretty much everything you need except a MicroSD memory card. We used it last year at a weeklong surf camp in the Dominican Republic (more on our trip during travel month in February!). The camera performed amazingly and we got killer photos and videos from it. I highly, highly recommend this camera!! The current version even allows you to connect the camera to your phone to instantly share your exploits to social media, and I think that is so cool! Every adventurer needs a good umbrella. One that won’t blow inside out in the face of challenging winds. My umbrella of choice is the GustBuster Metro 43-Inch Automatic Umbrella ($37). It can withstand winds over 50 miles per hour. I can’t tell you how many times I’ve witnessed everyone’s umbrella around me whip inside out as mine holds its shape. The secret? A double panel of sheeting on the umbrella which allows wind to pass through without contorting it out of shape. It saved our asses during a crazy hail storm on a hike this year. Some of my trips involve camping, but most are nicer voyages to classy hotels. On these trips I require a lot of toiletries and over a weeklong or twoweeklong stay I used to have trouble keeping everything organized. No more thanks to the Large Better Beauty Case ($20)! With four removable mesh cases, it’s easy to keep my toiletries divided yet organized. I have the blush color but there are lots of choices including python! The case also comes in a larger size. 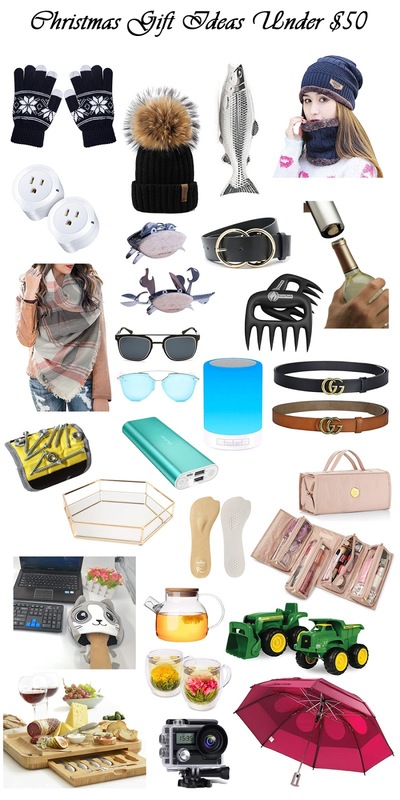 If you want to see everything I’ve mentioned in this post head plus a few more ideas head over to my 2018 Gift Ideas: Gifts Under $50 page on Amazon. What are some of your favorite gifts to give that come in under $50? I am loving all of these gifts! Such a wide variety, so there's something for everyone! That blanket scarf is so cute in plaid. Tried to get a little something in here for everyone. 🙂 Agree on the blanket scarf!